Costa Rica, the Switzerland of Central America it has been called. Less a few glaciers, this little country must be the Central American sister of that European safe haven. 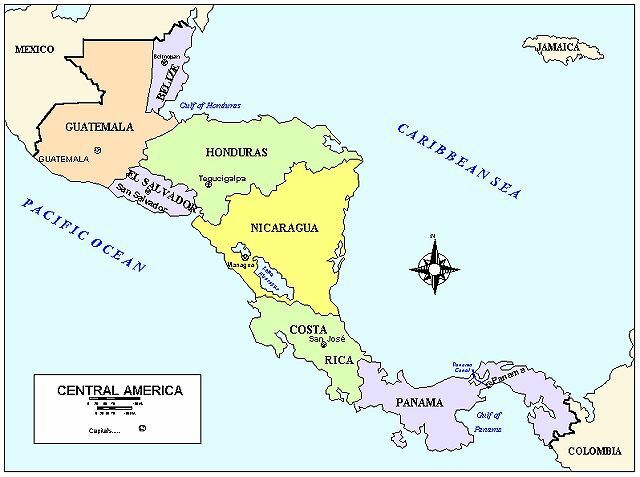 Bordered by Panama to the south and Nicaragua to the north, Costa Rica, which disbanded there military in 1949, has somehow managed to remain peaceful and politically stable for fifty-one years. Having recently been cast into the limelight for a rich and diverse ecosystem, it has become a hot spot for the adventurous traveler. Friendly people, tropical climates, favorable exchange rates and almost unlimited recreational opportunity, Costa Rica is one worth marking on your "Places to go" map. My friend, Rich Currie, and I headed south last month to check out this tropical land of coffee bean and banana plantations. Arriving in the capitol of San Jose, we picked up our 4x4 rental car. I had been assured that it would be a Suzuki Samurai or similar. What we got, however, was the "similar" model. It more resembled a Honda civic with a body lift. Suzuki Jimmy they call it, a Samurai would have dwarfed it in a side by side comparison. But what the heck, it had four wheel drive, coil sprung solid axles front and back and even a low range transfer case. We were styling. 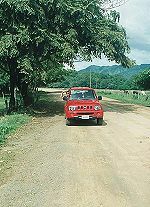 Stowing our gear, we pulled out our map and headed for the Inter-American highway. After exploring (getting lost in) a few of the local towns we found the Inter-American and made our way north towards the Peninsula de Nicoya on the Pacific Ocean. This area of dense jungle and remote villages, we were told, would provide ample opportunity for us to test our driving and navigational skills. We missed the last ferry across the gulf and had to wait until morning. That night, we bivouacked in the town of Puntarenas, feasting on local cuisine and roughing it in an air-conditioned room overlooking the beach boardwalk. The road winds through agricultural valleys and cattle ranches. A storm approaches near Playa Junquillal. The morning came and the ferry didn't leave until 9:30. We opted to make the six-hour drive around rather than wait two hours for the boat. From that point on, changing our plans like the direction of the wind would become the routine. The landscape along the Inter-American to the city of Liberia is mostly semi-dense jungle broken occasionally by a banana field, coffee plantation, or small cattle ranch. Iguanas bask in the sun and scurry across the road like jackrabbits on a Nevada two-track. The climate, sub-tropical in nature, tends to be on the warm and humid side. At the town of Liberia, about thirty miles from the Nicaraguan boarder, we turned east and then south to Santa Cruz. We spent a couple of days out on the Nicoya getting lost on endless dirt tracks through the jungle which would dead end into a village, a washout, a lagoon or an abandoned beach lined with coconut palms. Dusk of the second night found us on a remote beach near Playa Junquillal. With the threat of an approaching thunderstorm, we retreated back to Santa Cruz to get fuel and a cheap room. Using a machete, you can make this stylish coconut drink. Our morning chores consisted of buying a machete (to open coconuts) and exchanging currency. If you have never traveled in South or Central America, they haven't heard of "three is a crowd" bank lines yet. You can plan on spending several hours exchanging funds. Half a day in Bolivia if there is even money available. The bank lines, however, do provide a great opportunity to swap travel info with other vagabonds. In that particular bank line we found our next destination-- Tamarindo to the north. Tamarindo, we were told, was supposed to be pretty nice and it might provide us a chance to see the mangrove swamps and maybe a caiman (Central/South American alligator) up close and personal. We headed north. Tamarindo is a resort town with a white sand beach. Dozens of restaurants, small clubs and hotels line the one main street. Hotel prices varied from super cheap ($10.00 US/ night per person) to really nice but still reasonable ($100.00 US/ double). We hit the beach for some body surfing and dined on fresh fish at a local beachfront "soda" (restaurants and cantinas are called sodas). "Roughing it" in Tamarindo. Fishing boats at Playa Tamarindo. Sunset over the Pacific. The author viewing wildlife from a ponga. Costa Rica is the place for hiking. In the evenings, several caimans emerged at the entrance to the estuary. Slowly drifting with the tide, occasionally one would silently disappear only to reappear on the other side without even a ripple on the water. In the morning we shelled out ten bucks each and took a ride up into the mangrove in a ponga (small fishing boat) to view some wildlife. Passing a few caiman near the banks, the dead silence of the jungle was broken only by the low drone of our outboard motor. Mooring the boat, we took off on foot down a narrow path. The monkeys eluded us but we did see a few more small mammals and a variety of avian species. Arenal, Costa Rica's most active volcano. Our next destination was the volcano Arenal in the Guanacaste district. Heading northeast and through the fertile central valley, we ascended into the Cordillera. While circling the Lago Arenal, the clouds broke to the east exposing the top of the volcano. Being the tourists that we were, when Rich said, "Hey, there's lava coming out of the volcano"; I appropriately locked 'em up in the middle of the road to check it out. Sure enough, the clouds had cleared enough to see an orange lava flow oozing from the summit. Standing at 5356 feet, Arenal is Central America's most active volcano. Lying dormant for centuries, it finally blew its top in the late 1960's. Near the town of La Fortuna, we rented a cabana right at the base of the volcano. That night we sat on the porch and watched the show. The volcano had a small flow building up at the top. Every few minutes, gravity would win it over, pulling off a large chunk about the size of your garage, sending it down the cinder cone with increased velocity and disintegrating as it went. Settling near the base, the molten debris glowed a deep orange for several hours. In the darkness of a moonless night, the show was spectacular. We awoke the next morning to watch toucans, macaws and parrots from the porch. By 11:00 we were on horseback heading into the jungle for a canopy tour. This consisted of inch-worming your way up a 100 foot rope (dang, am I out of shape). After putting on climbing gear and hooking up to a cable 120 feet above the ground, you zip through the treetops like Tarzan to another platform. After several zip lines and shaky platforms, we rigged up with rappelling gear and back to terra firma we went. What a blast! The entire apparatus appeared to be held together with bailing wire, bubble gum and bungie cords. It held together and we survived. Horseback ride into the jungle. Zipping through the trees. Rappelling from the canopy. Crazy tourists on a canopy tour. Taking several hikes through the jungle to check out the local flora and fauna, we were careful not to roust any crocs. In an area which receives rain on a daily basis, the creeks were swollen and waterfalls numerous. The most spectacular of which was the La Fortuna waterfall. Arriving at the trailhead in a torrential downpour, the trail and the falls were void of traffic. At the end of a box canyon, the river plunges more than one hundred feet into an aqua-green pool. The rains had subsided but the rising flow of the river created an almost deafening roar and a gale force spray at the bottom. The lower pools, however, made for a great place to swim. Monkeys were swinging through the trees (quite distracting) as we made our way back around Lago Arenal and towards the Monte Verde Cloud Forest. This remote mountain village which is surrounded by dense jungle and almost constantly shrouded by clouds lived up to its name. The entire area at Monte Verde is set up as a wildlife preserve and the viewing options are endless. We checked out town, a few art shops, the national park and the hummingbird museum. Far better than an actual museum, it is a shop with dozens of hummingbird feeders nearby. Hundreds of hummingbirds of every variety congregate here to feed while providing close up viewing opportunity. We got the last room at a beautiful wood lodge named the Hotel El Establo. Owned by Ruth Campbell, one of the original Quaker settlers of the area, the El Establo is warm and inviting. As a toddler, Ruth made the 1951 journey down from Alabama with her parents. The warm atmosphere of the natural wood lodge and her many tales of the area, such as remembering the first glass window in town, could prompt one to settle in and stay much longer. The following afternoon brought another torrential downpour. Rather than being cooped up in a hotel, we decided to take the muddy track (now more of a river) down the mountain and head for the coastal town of Jaco. Crossing the Inter-American highway and catching the coastal road we headed south and stopped at the Tarcoles River Bridge. The Tarcoles River is a regular hang out for about thirty rather large crocodiles. While our map said there was a great swimming beach just a half-mile down river, the muddy bank looked a little crowded (not to mention dangerous) so we moved on. Beautiful beaches of Costa Rica. The little surf town of Jaco reminded me of the Southern California coastal town where I grew up. Sidewalk caf�s, surf and skate shops, and small motels line the one main avenue. Bohemian in nature, the crowd of local and transients (surfers) was notably laid back. Palm trees lined the long sandy beaches and set after set of perfect waves rolled off of a north swell. After rummaging through the local shops, we checked into another cheap room ($28.00 US/ double) and feasted at a local pizza soda. One could easily settle in this cozy little paradise and forget to catch their flight back to reality. Reality check�.the flight. In the morning we grabbed our coffee and pastries from our most recent favorite caf� and headed over the mountains to San Jose. Taking the back roads gives you a great opportunity to see the not-so-touristy stuff. Between fields of coffee, we happened upon some unique art galleries and craftsmen's shops. True works of art are created right before you and the prices are a fraction of what you might pay in the more touristy areas. Costa Rica is truly a place of beauty and is far ahead of the curve with regard to its national parks and ecosystem preservation. The locals have realized that the tourist dollar to view a live crocodile will far outlive the price received for the same croc's hide. The land, while well used by its citizens, is not being strangled with over-regulation. The people are friendly, climate mild, and prices fairly affordable. What a week: Iguanas, toucans, volcanoes, beaches, jungles, caimans and crocodiles! Well, we had to leave all this behind and head back to reality but plans were already in the works for another Central American adventure in tropical Costa Rica.